This means that if your visibility networks have gaps, your network security tools will have at least the same gaps. Why do inline security solutions need smart visibility deployments? If the security tool fails, the NN device allows the traffic flow to continue without any traffic loss. This feature also allows you to take down the security tool for maintenance purposes. Maintaining high availability of the security service (in case of tool failure) by implementing redundancy schemes. 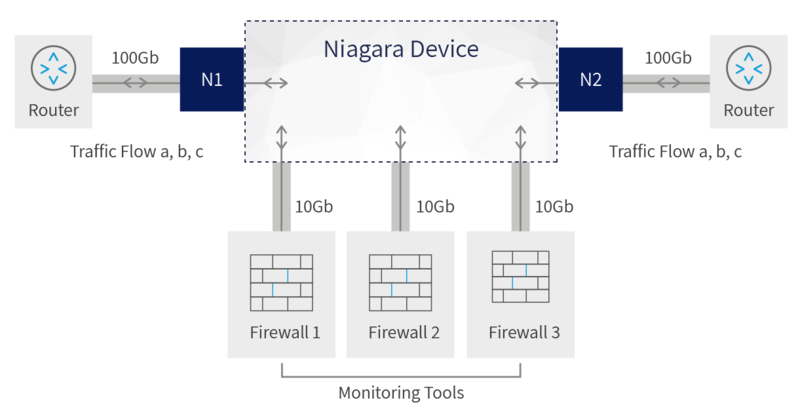 The Niagara Device is used for implementing 1+1 redundancy between security appliances. 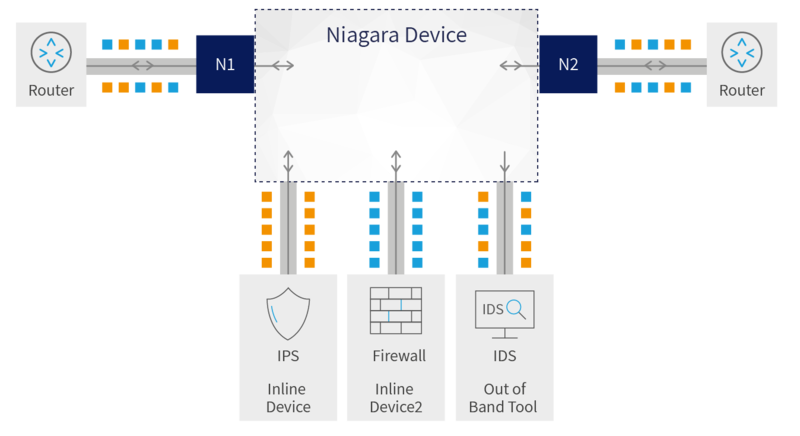 The passive bypass allows for continuous traffic flow even if the Niagara device itself fails. Load balancing between similar inline devices allows you to utilize existing network security tools (with lower processing performance), to handle higher capacity network links. For example: if your tool supports up to 10G and you want to upgrade your network to 100G, you can load balance your traffic to multiple tools. This feature also allows you to take down a tool for maintenance and the load balancing scheme will automatically redistribute the traffic to the remaining tools. No single network security tool provides you with all the security you need. You can use NN to distribute traffic between different types of security solutions, sending the right traffic to each tool, optimizing traffic management and tool utilization.